“And as they were coming down the mountain, Jesus charged them to tell no one what they had seen, until the Son of Man should have risen from the dead. So they kept the matter to themselves, questioning what the rising from the dead meant” (Mark 9:9–10). The longer reading appointed for today includes the account of the Transfiguration, when Peter, James and John went with Jesus up a high mountain and Jesus’ garments became glistening, intensely white, and Moses and Elijah appeared. Hopefully, you know the rest of the story. 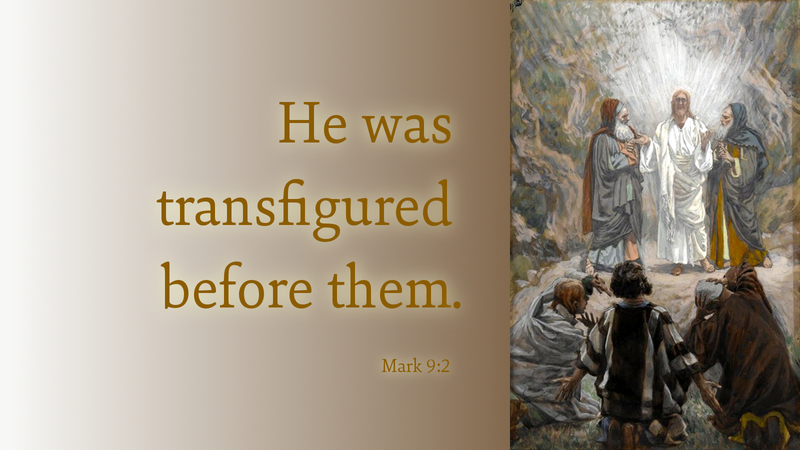 The sentences above are what happened after the Transfiguration. And it makes perfect sense to us that the three who were Jesus’ inner circle would keep silent, not knowing what to make of the Transfiguration, not to mention not understanding what “rising from the dead” might mean! Is that why we continue to keep the matter to ourselves, even today, because we’re still not quite sure what Jesus rising from the dead means? Most of us would say that we believe in Jesus’ resurrection from death, but could we explain it? Could we share its meaning with an unbeliever? Could we witness to what His death and resurrection means for us? As we approach Holy Week and our annual observance of the Passion, Death and Resurrection of our Lord, it might be good for us to spend some time pondering Jesus’ death and resurrection. How is my life different because of Good Friday and Easter Sunday? Is my life different? Do I experience the Risen Jesus in my day-to-day existence, or do I trudge along through life pretty much alone and oblivious to the Risen Lord? These are not easy questions, to be sure, but they are essential to how we live our lives, how we approach death, and whether we will live full of hope for the future or filled with a certain fatalism and defeatism. The dying and rising of Jesus means that death will not be the end of us, but that we will live anew. And that promise gives us new life daily, as every morning we are born anew to a living hope! Prayer: Almighty God, thank you for your Son, Jesus, who died, and was raised from death to give us a hope and a future; through the same, Jesus Christ our Lord. Amen.